Reduce your energy consumption and take control of your HVAC plant with our control system design services. In recent years, there have been a number of dramatic changes to the way in which BMS are configured. There are so many ways a BMS can be designed and installed, which means it is essential to get the best advice from experienced engineers to ensure you get a system that works as it should. Our experienced engineers can design any control system for residential or commercial properties, from a simple control circuit through to complex multi-networked systems working across many buildings. Their experience and expertise means you will have a control system design perfectly suited to your building to create comfort with ease and maximum efficiency. All aspects of our control system design are carried out by highly trained specialists. 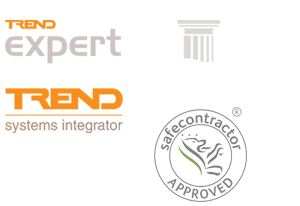 Our engineers are approved partners of Trend, Johnsons Priva and Honeywell, ensuring that your work is carried out to the highest standard using only high quality manufacturers.